We’ve already looked at birth control pills in Japan, so let’s talk about a few other contraception options. Perhaps not surprisingly, given their recent introduction to the country, birth control pills are not the most popular form of birth control in Japan. Condoms are still the leading form of contraception, so I’ll cover them briefly here, and I also want to mention IUDs and calendar-based methods. In answer to those wondering, yes, it seems that most Japanese condoms (コンドーム) are slightly smaller than Western brands in terms of diameter. That isn't necessarily true all the time, and of course the general shape and contour varies between brands and types (for example, for some brands the main diameter might be a certain size, but the diameter at the "tip" will be wider). The annoying part about trying to find the measurements of Japanese condoms is that most boxes don't include numbers on the packaging anywhere, so you often can't easily determine if the size will work or not unless you buy them, try one, etc., or do a bit of research online (in Japanese). Generally, from my own research, the size of Japanese condoms typically varies from 31 to 52 millimeters in diameter (though most size information I was able to find indicated an average of around 36-44mm diameter). Of the packages that are labeled with any kind of size information (such as “L” or “XL”), it is usually only the large sizes, and when I checked some of these online, the diameter was still under 52 mm. (For example, the “Mega Big Boy” condoms by Okamoto have a diameter of 46mm, according to Kenko.com). I also came across another brand of condoms at the store that said they were “XL”, but on the packaging, the size was indicated as “8mm more than ‘regular’ size” (in Japanese) - not very helpful. However, some Durex condoms, which I’ve seen in a few daily goods stores in Japan, are 52.5 mm and seem to be a standard Western size, though that can also vary. Of course, if you're having trouble finding condoms that fit, you can always order them online - either in Japan or from overseas. And I should probably mention that there are many brands, types, kinds, etc, so no lack of selection (unless you count certain sizes). I’d like to turn this over to readers out there; have you experienced difficulty finding condoms that fit in Japan? Do you have any suggestions? Note: Female condoms are also available, but they are more difficult to find than male condoms. IUD is commonly referred to as "IUD" in Japan, but the Japanese term for intra-uterine devices is: 子宮内避妊器具. The copper IUD (銅付加タイプ or 銅付加IUD) is available in Japan, and the most popular is the Multiload CU250R (マルチロードCU250R). Mirena, a progestin-releasing IUD (Mirena is also known as an IUS) is also available, known in Japan as ミレーナ５２ｍｇ (in general, referred to as a “hormone type”, or ホルモン付加型). As far as I can find, cost for copper IUDs is around 30,000 to 50,000 yen, while Mirena costs around 80,000 yen and up, though may vary depending on location and/or clinic/hospital. 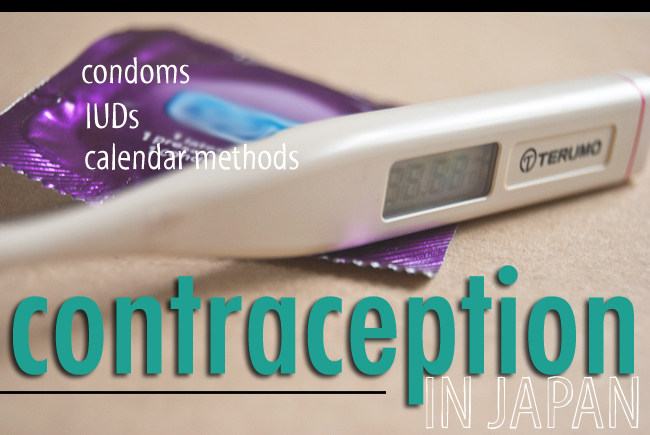 For more information about getting an IUD in Japan, check out this post. In Japan, you can find basal thermometers (usually look for something like 女性体温計) in most any daily goods store (usually either near the condoms or near the pads and tampons) - basic ones cost around 2,000 yen while those with various extra features are often 4,000 yen or more. As for charting, you can use paper charts (probably can find some online to print out), smartphone apps, computer apps, or online apps to keep track. Or you could just use a basic paper calendar, though I like the apps better because they help take out some of the guesswork and are just easy to have. So that's three more possible options in Japan you may have been wondering about. As always, would love to hear your experiences and suggestions in the comments below! Just wanted to add that when I went to the doctor to get a script for the pill, I was given a handbook in Japanese that listed the best choices for BC. It had all sorts of statistics on success rates if different methods. I was amazed when I saw the calendar/rhythm method listed as I'd always been told that was a real fate tempter. I'm curious if the 75%, (I THINK it was), success rate is accurate. I'm one of those, I guess, rare birds that can physically tell when I'm ovulating and the like and I still wound up pregnant while using the rhythm method, after coming off the pill. The pregnancy ended up not sticking, and it was really a close call as I wasn't prepared for a baby at the time. I'd really recommend sticking with condoms or either the IUD/pill, ladies. I do have a friend who orders her BC off of one of those pharmaceutical sites, (her contacts too), and she hasn't had an issue, so if you don't want to go to the doctor here/can't for whatever reason, that is an option. But use caution as it is of course risky, and do your homework: research whatever you want to buy first. I stopped the pill my doctor gave me here after finding out it was discontinued in America and that there were quite a few issues with otherwise perfectly healthy young women falling prey to strokes and blood clots elsewhere. Anyway, sorry to go on and on. Wonderful information. Thanks. This and the BC post are going to be bookmarked for future reference. I follow you on Twitter and it's helpful to have another foreigner to look to for information.